The Wild received some help on the out-of-town scoreboard Monday night, as the Coyotes fell to the Lightning, and that means the Wild can climb back into the second wild card spot in the Western Conference Tuesday with a win against the Avalanche. With 77 points, the Wild is just a point shy of Arizona with nine games to go. Not only would a victory put the team back in a playoff position after it dropped out of one last week, but the Wild would also put more distance between it and Colorado. The Avalanche is three points shy of the Wild. This is the final test of a season-long five-game homestand that is currently 1-2-1. 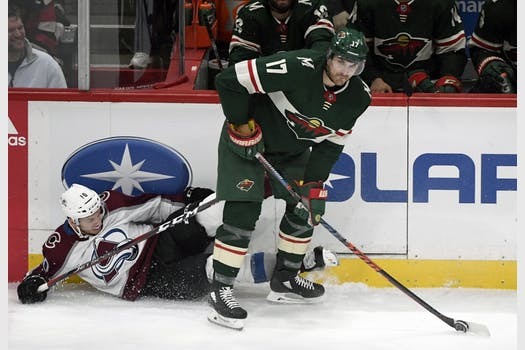 All of the Wild’s production came last weekend, when it topped the Rangers 5-2 Saturday and then banked a point in a 3-2 overtime loss to the Islanders – efforts that were much more reflective of the urgency the Wild needs to have success at this juncture of the season. Former Gophers goalie Mat Robson, whom the Wild signed Monday to a two-year, entry-level contract that starts immediately, wasn’t with the team on the ice Tuesday, but he’s expected to join practices at some point. “He’ll practice with us and see what the NHL life is all about,” Boudreau said. 13: Points in 13 games for winger Ryan Donato. 10: Points for winger Jason Zucker in his past 12 games. 2: Goals for defenseman Jared Spurgeon over the weekend. 3: Consecutive games for the Wild in which the power play has scored. 26:52: Average ice time for defenseman Ryan Suter, tops in the NHL. Colorado is starting a two-game road trip through the Central Division. It’s coming off a 3-0 win over New Jersey Sunday at home. Before then, the Avalanche had dropped two straight. Center Nathan MacKinnon eclipsed 90 points Sunday. He’s the only player in Avalanche history besides Peter Forsberg to post back-to-back seasons of 90-plus points.